Casey is good with kids, cats, dogs, horses, donkeys, and chickens. He was born 8/7/14 and is a gentle soul who is a little shy at first. He is available on 4/2/19. Not a great picture. Better ones coming. He is neutered and up to date on tests and vaccines. Casey will not be at our Thursday meet & greet on 4/25/2019. 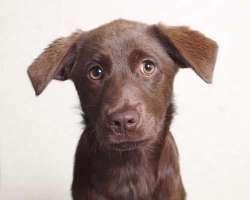 Parker is a 12 week old pup who was adopted a few weeks ago, but was returned for being too playful with the cat. Parker has learned a lot ay his previous home and is housebroken, friendly with everyone he meets and loves other dogs. Parker will need someone with a part time or stay at home schedule to meet his socialization and training needs. If you are interested in Parker, please fill out our online application. Parker will not be at our Thursday meet & greet, but will be at our Saturday meet & greet. Buddy and his siblings came to us from a rescue foster home in Louisiana. He is a young puppy so will require someone with a part time or stay at home schedule to meet his socialization and house training needs. 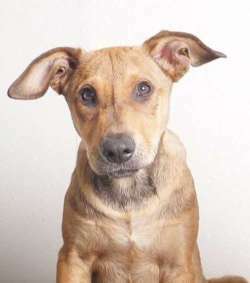 If you are interested in meeting Buddy please fill out our online application at http://www.saveadog.org/applytoadopt.asp and private appointments start Tuesday afternoon. 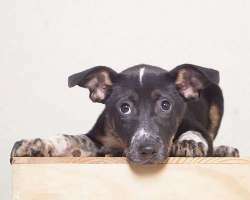 Lory and her siblings came to us from a rescue foster home in Louisiana. She is a young puppy so will require someone with a part time or stay at home schedule to meet her socialization and house training needs. 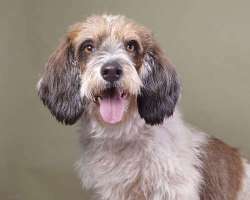 If you are interested in meeting Lory please fill out our online application at http://www.saveadog.org/applytoadopt.asp and private appointments start Tuesday afternoon. Neillson came to us from a shelter in the Bahamas. He was adopted into a family and did great with the kids and loved to play with the other dogs in the household. Unfortunately, there was a heath issue in the family and they were unable to give Neillson the attention that a puppy needs. He is a happy go lucky pup that loves to snuggle on the couch, play with his friends and is working on his basic puppy training commands. If you would like to meet this cute guy please fill out our online application. Teddy's overbite kept him from becoming a show dog so he was adopted. 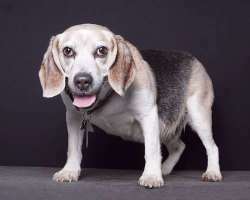 He and his side-kick Munch the Beagle are looking for a new home due to allergies in their previous household. They are nice adult dogs, can be separated but it would be ideal if they could go together. They were kept up to date with annual vet visits. Please apply if you're interested as he's not at the shelter. Munch and his side-kick Teddy are looking for a new home due to allergies in their previous household. They are nice dogs, can be separated but it would be ideal if they could go together. Munch takes a pill for seizures but he only had one mild one and was put on the medication. We think he could be weaned off with CBD oil. They were kept up to date with annual vet visits. Please apply if you're interested as he's not at the shelter. 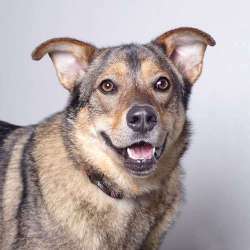 Massey is a beautiful 2 year old Shepherd mix who ended up in a Moscow shelter after her owner died and their family was unable to keep her. She has come here to find her forever family, where she will have a warm bed or a comfy couch with plenty of food and plenty of love. She is timid but very sweet. She will need patience and time to get comfortable with her new family. She would be an awesome friend for your dog as she loves other dogs and they help to build her confidence. A fenced in yard will keep her safe and secure. She's already made so much progress while in our care! She did great in the foster home, great with all members and with the two other dogs in the home. Bella is a 2 year old Aussie/Husky mix who is very smart and talkative (she will talk back to you!) sweetheart. She is awesome with kids, adults and other dogs. She loves to run and could be an escape artist hence a nicely fenced yard would be perfect for her. She likes to run, play soccer, chase balls and balloons (at daycare she is in the high energy group) but is also very happy to lay around and lean/snuggle with you. At doggy daycare she is in the high energy group. She loves to have her own chair but if you are sitting in the couch (and you will know she was in the couch because of the shedding! ), she will want to come snuggle in. House and crate trained, her current family loves her but is forced to give her up due to allergies. She will be available for meet & greet as of this weekend. Karen and her siblings came to us from a foster home in Louisiana. She is a young puppy so will require someone with a part time or stay at home schedule to meet her socialization and house training needs. 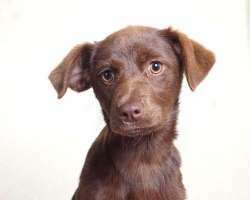 If you are interested in meeting Karen please fill out our online application at http://www.saveadog.org/applytoadopt.asp and private appointments start Tuesday afternoon. 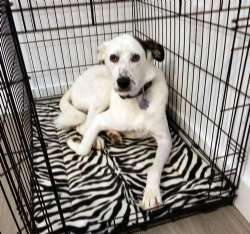 If the dog you saw on this page is no longer listed, chances are, s/he's been adopted. Try looking on our recently adopted dogs page!